It looks like Honda has jumped into the electric bike development arena with both feet! Honda’s Electric MX bike, dubbed the CR-E, was in action this week in Japan. The All-Japan Nationals are held each year in April and often provide a first look of the models for the upcoming year. This bike was on display earlier in the month at a show and is more of a concept bike than a prototype, proving that Honda has the technology to pull the trigger on an electric motocross bike any time the company brass feels the time is right. The CR-E wasn’t actually raced, but it was on display and it was ridden in practice. Yuichi Furukawa was there and shot a few photos for Dirt Bike. The motor was developed by Mugen who built an electric motocross bike back in 2017 and raced the Mugen Shinden electric Superbike to success at the Isle of Man TT. 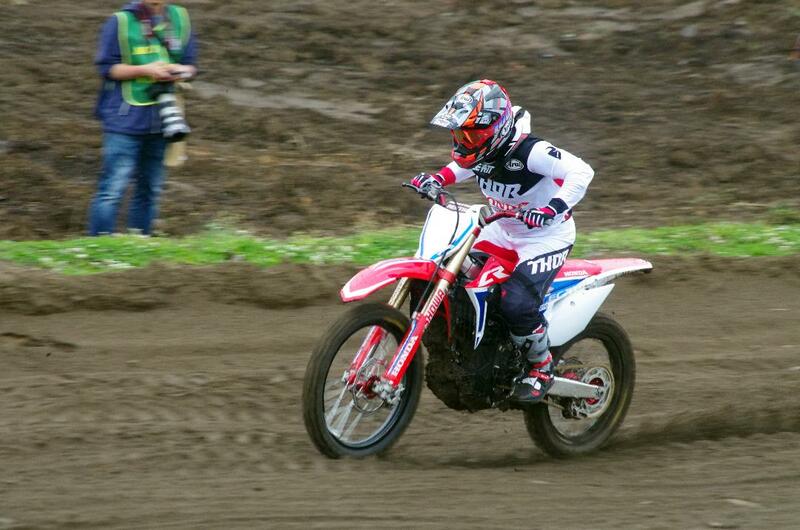 The chassis looks resemble the new CRF450R.